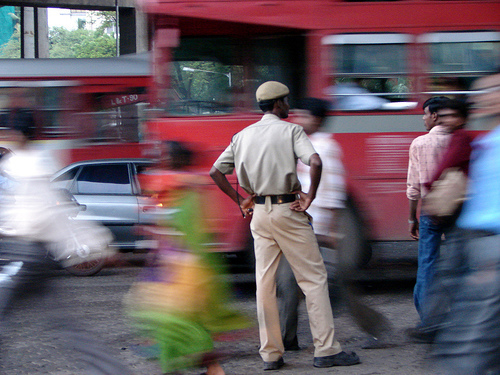 Traffic police help guide the flow of road traffic in Mumbai. Now if we could just solve overcrowding and ticketless travel on trains... Photo by calamur. Across the world, countries are grappling with the similar predicament of making public transport “cool” across economic segments and dissuading the use of private vehicles. The welcoming nature of government authorities with respect to advertising in and around public transport (like the Los Angeles Metro, which redesigned its brand to lure more passengers) is also connected to this idea. The mantra is simple: Better monetary inflow means improved services, which in turn translates to a rise in usage. However, a closer observation brings out one startling difference between developed and developing countries. For developing countries, sadly, the battle doesn’t end at merely shaping popular opinion. There’s another major problem staring transit users in the face, and unless it is dealt with, public transport will never realize its true potential. The problem? Ticketless traveling! In Mumbai, for instance, almost 6.9 million passengers ride the Suburban Railway system every day, making it one of the most densely used urban railway systems in the world. No doubt, that’s a significant number. More than 4,700 passengers are packed into a train which has a rated capacity of 1,700, creating a situation known as “super dense crush load” (watch some videos of the packed conditions here.) In spite of such tremendous usage, Mumbai local trains don’t get paid their dues because a large number of commuters travel without a proper ticket. They take advantage of the overcrowding and often escape the authorities, in this case, a team of Ticket Checkers. Massive overcrowding means the ticket checkers can’t conduct their job inside the train (during peak travel hours), which means most of their search is conducted on platforms, where again, the miscreants take advantage of the crowd and get away. Mohammed Zahid Qureshi, a Ticket Checker broke all records of booking ticketless travelers last October during Diwali, a popular Hindu festival where people travel extensively with their families to visit relatives and friends. In just four days, Qureshi booked 1,475 travelers and generated a fine of Rs 5.47 lakhs, all by himself! Add that along with fine generated by other Ticket Checkers and you have a mind-boggling figure. Despite Qureshi’s achievements, one cannot help but imagine how many people must be traveling minus a proper ticket in Mumbai every single day. And no, the fares aren’t unaffordable either. If each traveler ensures to buy a valid ticket, the profits made by public transport authorities, not just in Mumbai or India, but rather in developing countries across the world, will sky-rocket. India may be a developing country, but small rightful monetary contributions by everyone who uses public transport is key to the country’s economic turnaround. This brings us to the question of how. Adopting Metro rail technology can be a good idea wherein the person cannot enter or exit the premises without a valid token. However, until a technology upgrade takes place, one has to rely on individuals like Qureshi. Before we find out alternate ways of public transport, let’s try and utilise the existing ones to their fullest capacity.